Reverse migration, the changing expectations of employees, an ageing workforce and anywhere/ anytime working all represent unique hurdles for today’s businesses that need to compete successfully in tomorrow’s economy. But as the economic recovery ramps up, UK businesses also report an endemic skills shortage is hampering their growth efforts. This has put the search for innovative and effective ways to raise the bar on workforce skills high on the boardroom agenda. 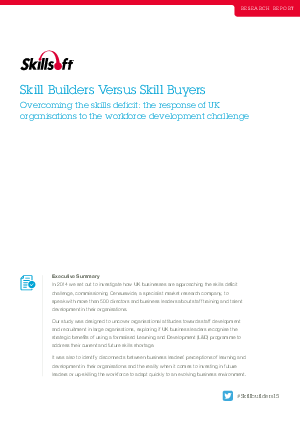 In this paper Skillsoft investigate how UK businesses are approaching the skills deficit challenge and provide their Top 5 takeaways in investing in future leaders and up-skilling the workforce.